Here are several-recent research-based articles and books about religion that make fascinating reading. Christianity in its Global Context, published by the Center for the Study of Global Christianity at Gordon Conwell Seminary (June 2013), provides an overview of global Christian growth trends for the period 1970-2020. This has been a period where the majority of Christians has shifted from North America and Europe to South America, Africa and Asia. The report provides a region by region analysis of the world and data to better understand the growth of Christianity in each region. This report can be viewed at www.globalchristianity.org/globalcontext. Have you come across a report or book that is fascinating reading? Feel free to share your “fascinating find” in the comments section. Usually we think as Europe as a Christian continent. However this is quickly changing. A headline in a Romanian newspaper drew my attention to this fact. This article noted that in France only 5% of Catholics go to church. In Denmark only 5% of Lutherans attend church. Only 3% of the population attends church in the Czech Republic. The Anglican Church declares that 10% of their churches (1,600) are empty and are no longer needed. A colleague of ours, who works in England, shared that between 1995 and 2005 the number of youth in English churches dropped 62% from 613,000 to 230,000. 39% of the churches in England have no one under age 11; 49% have no youth between 11 and 14 and 59% have no youth between the ages of 15 to 19 – alarming trends! If we compare the percentage of Evangelical Christians in Europe to other continents, we see that Europe has the smallest percentage of Evangelical Christians – just 2.4%! 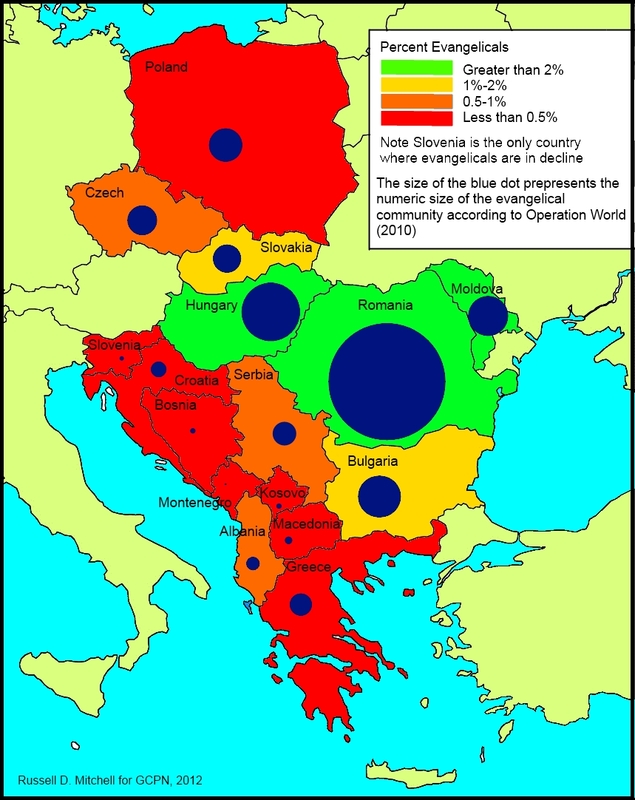 (Source: Operation World). Europe is quickly becoming a post-Christian continent. There is, however, that there is a significant difference between Eastern and Western Europe. While churches are being closed in Western Europe, there is a building boom for churches in Eastern Europe. In Poland churches are being demolished to build bigger ones, and in Russia 11,000 churches have been built since the collapse of Communism. We observed a similar building boom in Romania. Just a few minutes from our home there are two Orthodox churches and a Baptist church were recently finished. This building boom is one evidence of the spiritual awakening which has occurred in Eastern Europe since the collapse of Communism. Vladimir Putin’s concluding comment in his recent op-ed published 9/11/2013 by the New York Times, “We are all different, but when we ask for the Lord’s blessings, we must not forget that God created us equal,” could be considered another sign of a spiritual awakening taking place in Eastern Europe. Today Europe is a mission field, with so many turning away from the church and the arrival of immigrants from Asia and Africa. There are over 230 unreached ethnic groups in Western Europe today. It has been over 100 years since Europe experienced a significant continent-wide revival. Realizing that decline of Christian spirituality in Europe, churches from Africa, Asia – notably South Korea – and Latin America are sending workers back to Europe. Some of the largest, most dynamic churches in Europe are pastored by Africans. These countries recognize the contribution that European missionaries made to establish and build up the Church in their countries. Now, they realize, is the time for them to come to the aid of Europe. At a global level, the re-discipling of Europe is now a high priority – an unthinkable need just 50 years ago. What a transformation for the world’s most “Christianized” continent, seat of the Catholic Church, home of the Protestant Reformation and birth place of the modern missionary movement. The Center for the Study of Global Christianity, based at Gordon Conwell Seminary, published In June 2013 an excellent report (in my opinion) regarding Christianity in its Global Context. This report presents analysis for the period 1970-2020 and points out implications for society, religion and mission. The full report can be found online at www.globalchristianity.org/globalcontext and includes a number of eye opening observations. Things are not the way the used to be! The report documents the global shift of the majority of Christians from the North to South from 1970-2020. Specifically this 50 year period witnessed the shift of the Christian Majority from the Global North (North America and Europe, including Russia) to the Global South. In 1970 43% of Christians lived in the Global South. By 2010 59% of Christians were found in the Global South and it is projected that two-thirds of all Christians will live in the Global South by 2020. (p.14). While Christianity has made significant gains in the Global South, there were also significant declines of the Global North. Overall the global percentage of Christians increased just 0.1% over this to year period, from 33.2% to 33.3%, for essentially zero net growth (p.12). My intent is not to restate the findings of the report, but to further analyze CSGC data and highlight continental growth trends not included in that report. Specifically I want to highlight what’s hot (where Christianity is growing) and what’s not (where Christianity is in decline). The data gleaned from the CSGC report and my calculations is presented in the following two tables. Table 1. Key Christian Indicators by Continent. (1) AAGR is an abbreviation for Average Annual Growth Rate. (2) AACR is an abbreviation for Average Annual Conversion Rate. AACR represents the percentage of those becoming Christians from other religions. This is determined by subtracting the percentage of the Average Annual Population Growth Rate from the AAGR. (3) The CSGC report presents two perspectives on the estimating number of Evangelical Christians in each continent: namely that of the Center for the Study of Global Christianity and Operation World. Here I have chosen to average these two estimates. In all but one instance (Europe), the figure given by Operation World is higher than the CSGC figure (pp.16-17). My own field experience and conversations with other researchers leads me to believe that the Operation World estimates for Evangelicals tend to be on the high side. (4) Oceana represents Australia, New Zealand and other Southern Pacific Islands. There are many different angles from which to view the data. What’s hot here depends on the question asked. If you ask which content has the most Christians or has the highest percentage of Christians, then Latin America is the hottest. 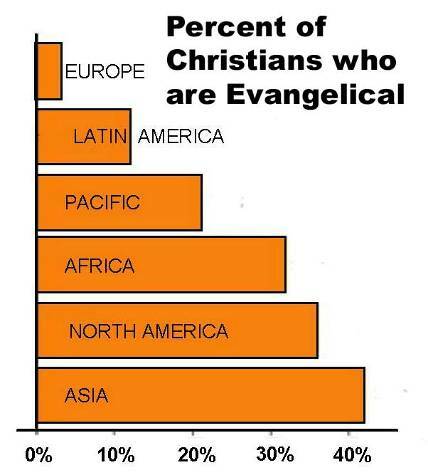 But if you ask which continent has the most evangelicals, then Africa is hottest. Still, if you ask where the largest percent of Evangelical Christians are found, that would be Northern America – (but Northern Americans should not boast too soon as significant concerns will be noted in the next section. If you ask which continent which continent has the highest Average Annual Growth Rate, then Africa is at the top (3.02%) closely followed by Asia (3.01%). If you wish to know where the rate of conversion to Christianity from other belief systems is the highest, this would be Asia at 1.48%. I call this the Average Annual Conversion Rate, which is determined by taking the Average Annual Growth Rate and subtracting the Average Annual change in Population, which represents natural population growth (the net difference between the birth rate and death rate as well as emigration and immigration). By way of honorable mention, Eastern Europe, including Russia, has seen a revival of interest in Christianity, especially since 1990, adding almost 90 million to the number of Christians, an increase of 28.6% (AAGR 0.91%). 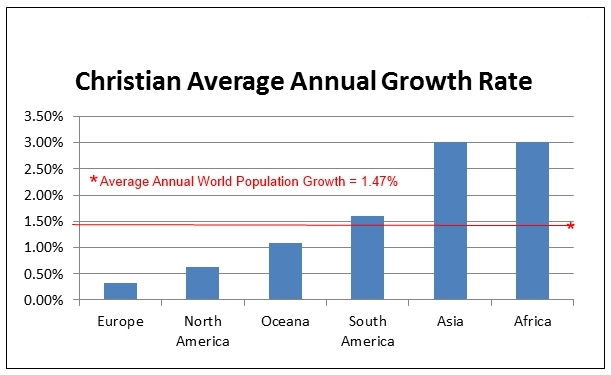 On the other hand, the CSGC data point out where Christianity is struggling. Again there are several perspectives. 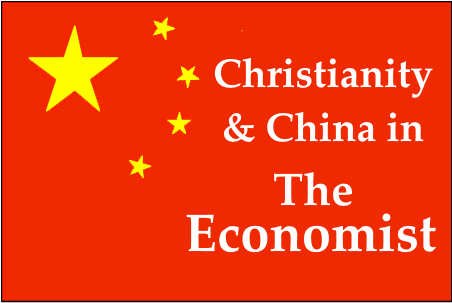 The least Christian Continent – percentage wise – is Asia; although there are more Christians in Asia than Northern America! Also Asia has nearly six times more evangelicals than Europe and more Evangelicals than Europe and Northern America combined. And Asia’s Evangelical Growth Rates are the highest in the world. So what Asia lack in quantity, it makes up for in quality! Based on Average Annual Growth Rates the percentages of Christians in Latin America, Northern America and Oceana are in decline. Europe (excluding Eastern Europe and Russia which experienced a revival in Christianity after 1990) also has experienced a significant decline in this period, the percentage Christians declining nearly 15%. Evangelicals are also losing ground in Oceana and Northern America – and again, if it were not for Eastern Europe, Evangelicals are would be losing ground in Europe too. Oceana, Northern America and Europe are not. So does anything you’ve seen here surprise you? What further questions arise in your mind? In my next posting, I intend to look at this same data at a country level, asking what’s hot and what’s not. I can guarantee that there will be some eye opening surprises!